WENHAM- Theresa C. (Richuits) Gorini, age 106, died October 20, 2018 at Sea View Retreat in Rowley. She was the wife of the late Joseph P. Gorini. Born in Jefferson, PA, she was the daughter of the late Fernando Richuits and Romilda (Varratto Richuits) Acciavatti, and her husband Simone Acciavatti. 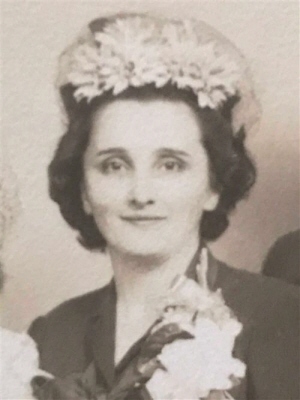 Mrs. Gorini was a hair stylist and owner of Theresa’s Beauty Salon in Peabody, worked as a licensed realtor, and was the proprietor of Vivian’s Dress Shop in Beverly for several years. Theresa was very family oriented. She was an extraordinary knitter and a gourmet cook. In her early years, she was an artist. She is survived by her daughter Vivian Harding and her husband Leonard of Danvers, grandson Christopher Levin and his wife Maureen, granddaughter Vanessa Nelson and her husband John, and granddaughter Daveda Burnett and her husband Andrew, great-grandchildren Olivia Nelson, Hannah Burnett and Hailey Burnett, and sisters Amelia Lyons of Danvers and Mathilda Hyde of Beverly. She is predeceased by her brothers Armand Richuits and Thomas Acciavatti, and her sisters Anne Bucci, Valia Morin, Desolina Ward, and Lorraine Mead. Visiting hours are at the Campbell Funeral Home, 525 Cabot Street, Beverly on Tuesday, October 23 from 4 to 7 p.m. Her funeral Mass will be celebrated at St. Mary’s Star of the Sea Church in Beverly on Wednesday, October 24, 2018 at 10:30 a.m. Burial will be in the Wenham Cemetery. Relatives and friends are invited to attend. Information, directions, and condolences at www.campbellfuneral.com . To send flowers or a remembrance gift to the family of Theresa C. Gorini, please visit our Tribute Store. "Email Address" would like to share the life celebration of Theresa C. Gorini. Click on the "link" to go to share a favorite memory or leave a condolence message for the family.